​I came into this motherhood thing READY. I was in my late 20s, married, had a degree, and had started a consulting business so I could work from home with flexibility. I had babysat, worked as a camp counselor, a camp life guard, an after-school program aide, a tutor, a Sunday school teacher, a youth group leader, and a volunteer mentor. I once calculated I had worked with more than 1,000 children by the age of 22. I loved kids, that was just a big part of who I was. I had even worked with kids with some disabilities; when I was 14 my first job was a camp counselor for United Cerebral Palsy. As it turns out, none of that mattered. I was utterly unprepared for what I got myself into. How could my son be so different from the 1,000 other children I had worked with? With all that experience, surely I must have learned something, right? Quick, what’s your instinctive response to the following hypothetical scenario? Your 8 year old, who is doing pretty well in life overall lately despite his ADHD and autism, is being taken to an after-school activity that is, shall we say, “non-preferred,” by a baby sitter. On the way, the sitter stops to buy a bottle of water. Child proceeds to scream at the top of his lungs, run around the store, and just runs faster than the sitter and TWO store employees for ten minutes until one of the employees threatened to call the police. Not Very Intuitive Parenting (NVIP) means that you must intentionally eschew everything you think you knew about raising children and leave your instincts at the door. Instincts? Ha. Do you want to know how I handled the above situation? First I sent him to his room, for the safety of all involved. Then I called the child psychologist to develop the consequence. Then I bought poster board and wrote up a big schedule of his activities to see. I’m currently evaluating social story software in between working full time, and dealing with medical appointments for both my child and I.
I have been to meetings where I hear about how “no” is a trigger word many families try to avoid all together. These are not actually overly permissive parents, but people who work very hard to help their children. And you know what? Sometimes it does take experts. It’s not permanent. They are conditioning the child to accept no. It’s just that if it isn’t done slowly and in a way that understands the limitations, their child will never be able to learn what a neurotypical just learns to accept more easily. I’m never going to succeed at getting my child to hop to with the “mom look.” He can’t decode negative facial expressions. Steam could be coming out of my ears but I need to verbally notify him that I am very angry. I remember it being a fairly obvious rule that you shouldn’t bribe children to get them to do what you want them to do anyway. Do you think that there is any other way to modify, or change, the behavior of someone who is hard wired to have a different behavioral response than a neurotypical person might? Incentivizing behaviors is considered to be a completely legitimate intervention however, and it works. Applied Behavioral Analysis is the dominant treatment for Autism Spectrum Disorders. This has to be the most Not Very Intuitive thing in the world! You have to become a scientist, analyzing your child’s behaviors for patterns to identify the need he is communicating with the behavior. You have to take data on behaviors like following instructions, toileting, greeting people. Are you serious? Special needs parents are going to do what needs to be done, but are you kidding me? What I want you to know about Not Very Intuitive Parenting is that usually, if you see me practicing it, I want to shout “this isn’t what it looks like!” Yes, there is a reason for why I am hugging and comforting my child who just had what looks like a total bratty tantrum. Or why when he does something awful you might just hear me say “one point,” and it might look like a dramatic under-reaction but you don’t know that he is working hard for something and that was a big setback. Usually, if my kid is acting up I’m going to employ specific, strategic responses that have been developed with the assistance of experts and following so many hours of assessments and therapies. It may not look like a reasonable response to you. Trust that I tried it your way at first. 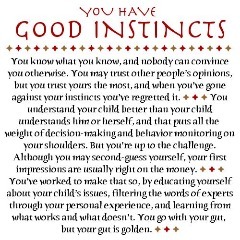 No one had better parenting “instincts.” Turns out, I have less use for those native instincts than I expected. I don’t mean to suggest that there is no use at all for a mother’s intuition, standard edition. I know how high a fever is with a kiss on the forehead. I know when something is wrong. It is the ultimate evolutionary instinct to protect my child above all else. But I also build new instincts. These are stronger. For better or worse, there’s no “because that’s how my parents did it” to fall back on. So, you have to come up with a new way. My skills in advocating for my son medically and educationally have made me a stronger person. I do trust my instincts over the experts, now. But my instincts have been reshaped to incorporate the wisdom of highly educated and experienced specialists whose good advice and guidance that have helped him already. It’s been re-shaped by online communities of folks in the same boat. It’s been re-shaped by trying to keep up with cutting edge research. Now, more often than not, I make decisions based on this specialized body of knowledge than instincts. Or at least I do when I’m doing it right and not falling into bad parenting habits and ineffective approaches. So if you too have absolutely no idea what you are doing, it’s ok. It’s not just like riding a bicycle. You adapt and you learn how to best help your child. And that driving love? That is the most intuitive thing in the world. if you are able to attribute this quote.